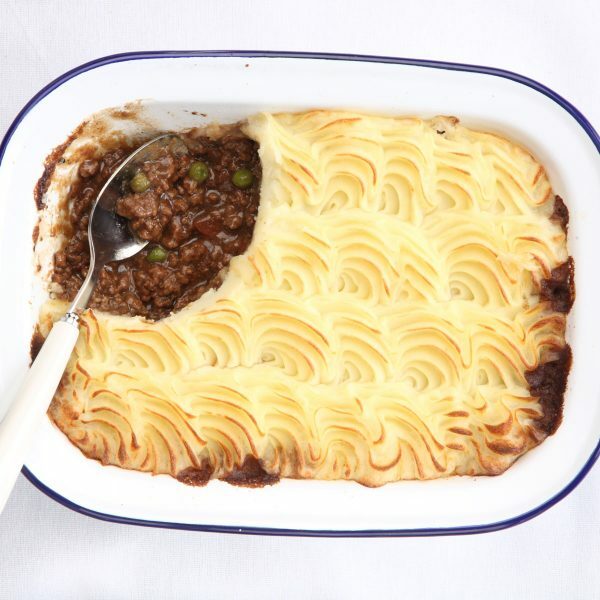 Cottage pie / Shepherd's pie - home cooked food delivered. This British classics may well be the epitome of good home-cooked food. The Shepherds pie with succulent lamb mince or the Cottage pie with tasty beef mince; both with delicious winter vegetables, rich meaty gravy and a mashed potato topping that’s creamy inside and crispy on top. This dish makes for a wonderful family supper which takes no time to reheat after a busy day. Shepherd's pie: minced lamb, carrots, celery, rosemary, lamb stock, potatoes, onion, MILK, butter, seasoning.Cottage pie: steak mince, carrots, peas, beef stock, bay leaf, fresh thyme, celery, garlic, plain flour (GLUTEN), MILK, tomato puree, red wine, worcestershire sauce (FISH), potatoes, onion, cheddar cheese (MILK), butter, seasoning. Remove outer packaging and place wooden box on a baking tray in a preheated oven at 180°C for approx. 35-40 mins. Ensure product is piping hot before serving.